Again today is a bit of cheat. I had been going through all my October issues and this is the next one on the pile. It's October 1981. I am in the earliest days of my gaming life, having played Basic D&D pretty much exclusively but adding the bits from AD&D where we wanted. This would place me in 7th grade and my life was full of D&D and learning to program on a TRS-80 Model III. Radio and the movies have been dominated by "Endless Love" and "Arthur" since August and on the shelves is Issue #54 of This Old Dragon! Ok let's get to that cover. I HATED it! Not because it is bad or anything, but when I was little I had gotten really scared of the trees in the Wizard of Oz movie. I also was scared of the Tree Monster from the terrible movie "From Hell it Came". Poltergeist didn't help either. Ever since then Tree Monsters freak me out. Not today of course...that would be silly...(looks behind). But all kidding aside it is actually a really fun cover. We start of the issue with a letter from J.D. Webster concerning the fate of the comic Fineous Fingers. FF was also that bit of D&D history that "predated" me. While I was playing and had been now for two years (little less) I was not reading Dragon yet and I had not even heard of White Dwarf. I used things like FF to judge how long people had been playing. If they talked about it I knew they had been more involved than me. Plus one of the groups in town had a player (I forgot who) whose character was Fineous Fingers. Oh, the letter. Yeah, this is the last issue for FF. There are some letters, mostly about a recent adventure competition. 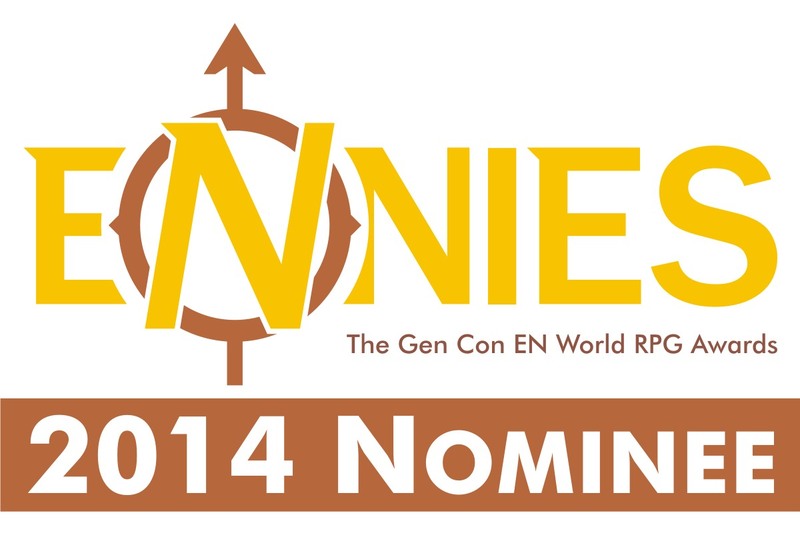 Up first in real articles we have something from Ed Greenwood. So this year (2017) I have been spending some time expanding my knowledge of the Forgotten Realms. This article is one of the earliest articles on the Realms I know of. 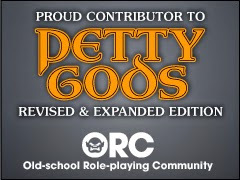 Down-to-earth Divinity discusses how Ed has put together his Pantheon of Gods. You can easily see how this evolved into the gods of the Realms. I found it interesting that he includes the elemental gods from the Melnibonéan mythos. There are a lot of "reskinned" Deities and Demigods gods here too (which is the point of the article). I liked that Ed specifically mentions that witches worship Selûne. The article is long and seriously good. 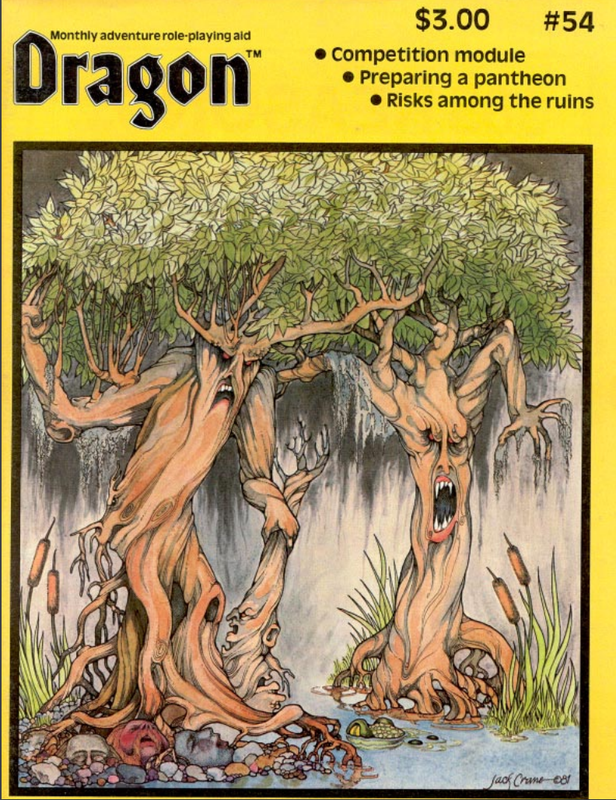 A feature I loved in the past is present in this issue, The Dragon's Bestiary. We get a different version of the Boggart here, closer to it's Brownie origins. 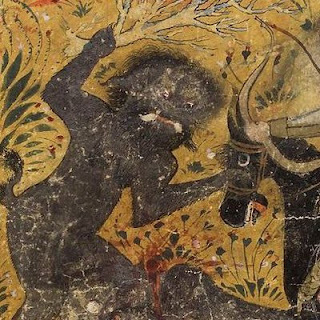 The Stroan, which looks like a giant water bug, and the Incubus. Beware the Jabberwock is next by Mark Nuiver. Background and stats for the creature and the poem that gave us the vorpal sword. The centerpiece of this issue is the competition adventure for AD&D, Cavern Quest by Bill Fawcett. It's a long one and has one of the most complex scoring systems I have seen. It might be fun to try with the right group. Abomination is the fiction bit. Seems related to the cover. Cash & Carry for Cowboys by Glenn Rahman is one of the very few Boot Hill articles I can recall reading in the pages of Dragon. Odd that Boot Hill has not been remade in the wave of nostalgia hitting both WotC and the OSR. It is a very useful price list of items for sale in the Old West. Simulation Corner by John Prados looks like it was a semi-regular feature on Game Design. This one, Practicing Game Design III Rules of Realism covers how to get realism into your game. It might be interesting, in a purely academic sense, to compare this five-part series to what later would be said about GMS game theory or the work at The Forge. My philosophy of game design is a simple one. Do what is fun and serves the game the best. Derive everything else from that. Another favorite feature from the past, Bazaar of the Bizarre is next. This time we get More feather tokens by Edward J. Greenwood. To go with a loose Halloween theme there is the Skull Mace, Mace of Pain and Jug of Undead. Hmm...there is a continuation of an article on Ruins that I don't seem to have the first part of. There is a silly little technology quiz on page 74. At 11 I would have loved it. Today...it's like seeing an ad for polyester kung-fu pants. We get a What's New. A Dragonmirth. Both Wormy and Fineos Fingers in color. Loved these ads. But you never got to fight a Purple Worm in Basic! And and ad for the D&D Folders. Always wanted one of these! Great issue. Not very Halloween-filled, but still a lot of fun. Here is what I said about White Dwarf #27 from the same month. This was the first issue of DRAGON that I ever purchased (the first one I ever read was #50, borrowed from a friend). I can still remember buying this issue, the DMG, and a very large gem blue eight-sider at JC Penny's--back when our JC Penny's carried role-playing products. 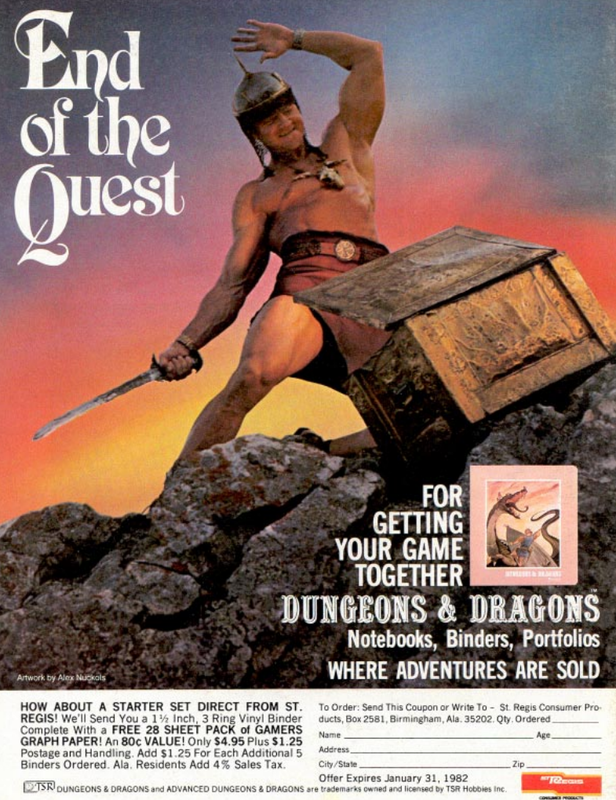 I tried taking that solo adventure in the magazine and failed miserably, largely because it required a pretty in-depth knowledge of AD&D rules... which I didn't have, as I had only just purchased my first AD&D book! If it's the story I'm thinking of (the ranger or druid traveling into the heart of an evil sentient swamp), the fiction in this issue was a real favorite of mine back in the day. I didn't care for much of the fiction in Dragon, but that one really stood out. A tree is an evil being that stands silently beside the road for 100 years, only to jump in front of your car while you're adjusting the radio. 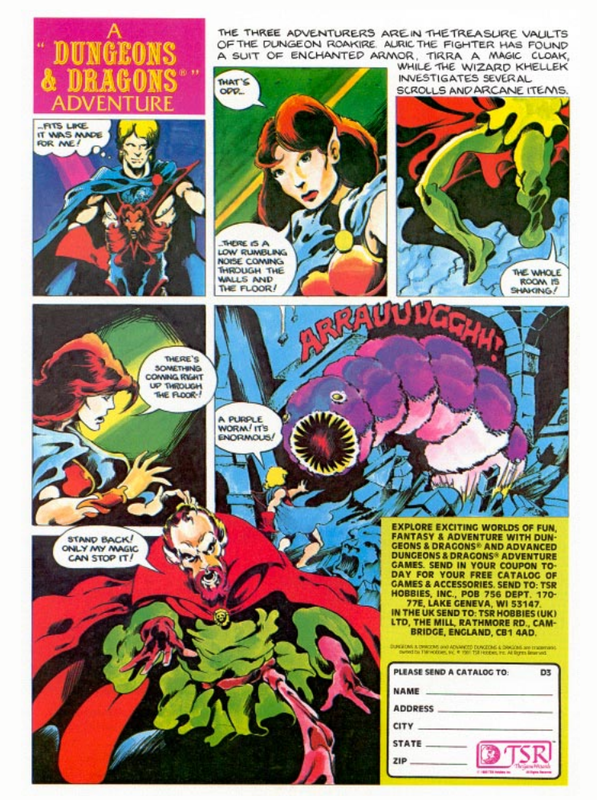 I think I would love to read all the comic D&D ads. I can say I never read this one until now.